Sharp’s AQUOS BOARD™ PN-L703A is designed for smooth and effortless communication in a wide range of contexts. The PN-L703A’s highly responsive touch pens allow several people to write on the same screen at the same time. And Sharp’s Touch Display Link software enables multifaceted wireless communication. Whether in the boardroom or the classroom, Sharp changes the way you communicate. 70″ Class (69 – 1/2″ diagonal) Screen Size – Combined with Sharp UV2A photo alignment technology, helps create brilliant color images with maximum size and impact. 10 Point Multi-Touch/Multi-User System – Recognizing up to 10 points of contact, the PN-L703A allows up to four people to write on the screen at the same time using touch pens or fingers. Quick Startup – The whiteboard function can start up quickly at the press of a button. Smooth, Highly Responsive Touch Pen – Pressure sensitive lightweight touch pen allows writing with high precision with an effortless and uninterrupted flow. 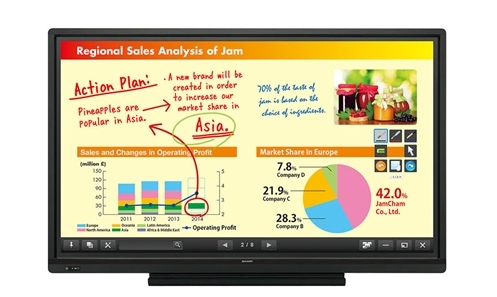 Touch Display Link 2.0 Software – Onscreen content – including handwritten notes and drawings made in real time – can be viewed simultaneously on the AQUOS BOARD and mobile devices such as PCs, tablets and smartphones. Touchscreen-Specific Stand – can be set up in a vertical (90-degree) or low-angle (25-degree) position thanks to a dedicated stand that allows the monitor to slide easily between the two angles. Touch-Operated Onscreen Display – Allows effortless switching between various input sources without the need of a remote controller. Enhanced Anti-Glare and Fingerprint Reduction – Protecting the screen is a specially coated film that works to reduce glare and reflections and minimize fingerprints on the glass surface. 3-Year On-Site Limited Warranty – Covers parts, labor and backlight. Built-In 10 Watt per Channel Front Facing Stereo Speakers – Eliminates need for an external audio system for many installations. Want to see the AQUOS Board in action? Request a demonstration today!